My camera was set up with a relatively wide-angle lens but the sea lion was moving so fast and so unpredictably that I was not able to compose an interesting photograph. Every single time I was ready to trip the shutter, the sea lion moved out of my frame. The perfect moment was there to be captured, but it only lasted an instant before the sea lion darted away. Although I was a beginning underwater photographer, I had been teaching diving for several years by that time. However, my credentials did not impress the sea lion enough to gain its cooperation, and 15 minutes later when it swam away I knew I had not shot a single frame that I would want to keep. Not one who is easily discouraged, I swam off in pursuit of another subject. It didn’t take long before I encountered a squadron of bat rays swimming through the kelp. As I tried to approach the rays I became frustrated by their ability to keep their distance from me without having to beat their mighty pectoral fins. Swimming as fast as I could, I could not close the gap to get the photograph I had in mind. Some 25 years later I face the same types of challenges every time I enter the water with my camera. A lot of wonderful marine subjects ranging from sharks and manta rays to garibaldi, groupers, angelfishes, squids and cuttlefishes have outmaneuvered me time and time again with apparent ease. Have you ever had a similar experience? Perhaps you were trying to take a photograph or maybe you were just trying to get a good look at a fish or other marine creature. But all you got was foiled. You were outmaneuvered, outswam, out-thought and out of luck. In the end you were left to wonder how it is possible for so many creatures to be so much more efficient than divers when moving through water. My experiences caused me to consider the importance of body design in an animal’s ability to maneuver and swim fast. Why can some fishes and other animals easily outswim us, while others are relatively easy to keep up with? And how does their speed and maneuverability, or the lack of, relate to the general shape of their bodies and their lifestyles? Answering this question provides valuable insight into the lifestyles of various marine animals, and, in turn, this knowledge will help you better understand where to find different types of creatures during your dives. The ability of a fish or any marine animal to get from place to place is a function of the successful combination of the creature’s shape, locomotive movements and adaptations. Two factors work against attaining speed in water. They are “drag” and “pressure resistance.” Superb swimmers have bodies that keep drag and pressure resistance from the water to a minimum. Drag is the result of a combination of factors including shape, speed, the surface design of the animal or object, and the nature of the way water flows over that surface. Studies show that as an animal or object moves through the water, the faster the speed, the greater the drag. Pressure resistance is a consequence of a shape having to part and push water in front of a moving body while forcing the water to flow around the body. In general, the longer the body and smoother the flow of water along the body, the less resistance and the faster an animal can swim. Given this knowledge, it probably does not come as a big surprise to learn that torpedo-shaped fishes such as barracudas, tunas and wahoo are among the fastest swimming fishes. However, there is a fly in the ointment here. A slightly disrupted flow is better than a perfectly smooth, or laminar, flow if speed is the objective. Amazingly, dolphins, which are mammals — not types of fish — can alter the shape of their skin almost instantaneously at microscopic levels to optimize water flow characteristics and gain speed and efficiency. Fusiform: More or less torpedo-shaped with a slightly rounded head and a long, thin tapering body. 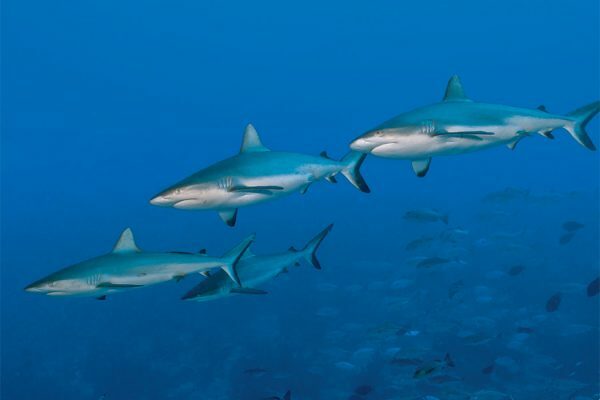 Examples include wahoo, barracudas, tunas and many open-ocean sharks such as blues, makos and oceanic whitetips. Generally speaking, fusiform-shaped fishes are the fastest swimmers. Laterally Compressed: Flattened from side to side, as is the case with angelfishes, filefishes, butterflyfishes and damselfishes such as garibaldi and sergeant majors. Dorsoventrally Compressed: Flattened from top to bottom, thus creating a wide, flat profile. Examples include stingrays, angel sharks, crocodile fish, and flatfishes such as halibuts, turbots and flounders. Attenuated: Long and thin, having a body diameter that is very small compared with the length. Eels provide classic examples. Eels grip the water with one side of their bodies and push with the other as they “ess” their way along. Just in case you are wondering, eels are fishes. Sea snakes, which are reptiles — not fish — swim in a similar manner. Unusual: Each with comparatively few representatives such as sea horses, cowfishes, trunkfishes and boxfishes. People often have a desire to categorize wildlife by being able to place every body design, adaptation, and habitat, etc., into neat, distinctly defined piles because doing so makes our interpretation of the natural world much simpler. However, Mother Nature doesn’t always cooperate. In the case of fishes, most species demonstrate a combination of characteristics from the just-described basic body designs. Each combination provides the possessor with a different set of abilities that suits and helps define its particular lifestyle. Take many of the fastest swimming fishes as examples. Tunas, jacks, open-ocean sharks, barracudas and wahoo are generally fusiform, but their fusiform shape has been altered with a slight flattening from side to side. This design, combined with strong muscles and big, powerful tails, yields a variety of excellent shapes for the speed needed by top-end open-water predators. Many large, predatory reef fishes such as groupers and sea basses are not necessarily fast, long-term swimmers, but they can go from a dead stop to full speed in about one-fortieth of a second. On the whole, groupers and sea basses are somewhat fusiform, but less so than the previously mentioned species. The generally fusiform shape of groupers and sea basses helps them attain speed, but their shape requires a broad, powerful tail to propel them through the water quickly. Fast-swimming sharks such as mako sharks, salmon sharks and great whites are also equipped with tails that are larger and stronger than the tails of many other sharks. Fishes with laterally compressed bodies tend to demonstrate high maneuverability. These fishes are designed to get into and out of the tight confines of a reef community to capture prey and seek cover in reefs that are filled with a latticework of crevices. Garibaldi, a damselfish that holds the distinction of being California’s state fish, blacksmith fish and butterflyfishes provide classic examples of species that are well-adapted for slipping into thin crevices to seek prey and to hide from predators. Add an elongated snout onto the end of a laterally compressed body, as is the case with many butterflyfishes such as the longnose butterflyfish, and you have fishes that are superbly designed to hunt in the tight confines of a reef. The trade-off for being able to operate efficiently in tight quarters is that laterally compressed fishes cannot attain the faster swimming speeds experienced by fishes that display more fusiform shapes. Fishes that have bodies that are rather long compared with their diameter are said to have an attenuated shape. This design helps minimize water resistance when these fishes swim. Eels and other attenuated species that have flexible bodies are also able to enter crevices that are inaccessible to animals that have a more “wide-bodied” design. Their shape helps give attenuated fishes a large selection of hiding places as well as increased ability to seek out prey in areas where hiding places are plentiful. Certainly there are lots of other unusual body shapes found in fishes that work well enough for species to flourish. Many of these species are comically slow swimmers, but a variety of adaptations allow them to be successful. Armor-plated bodies help cowfishes, trunkfishes, boxfishes and other relatively slow swimmers survive. 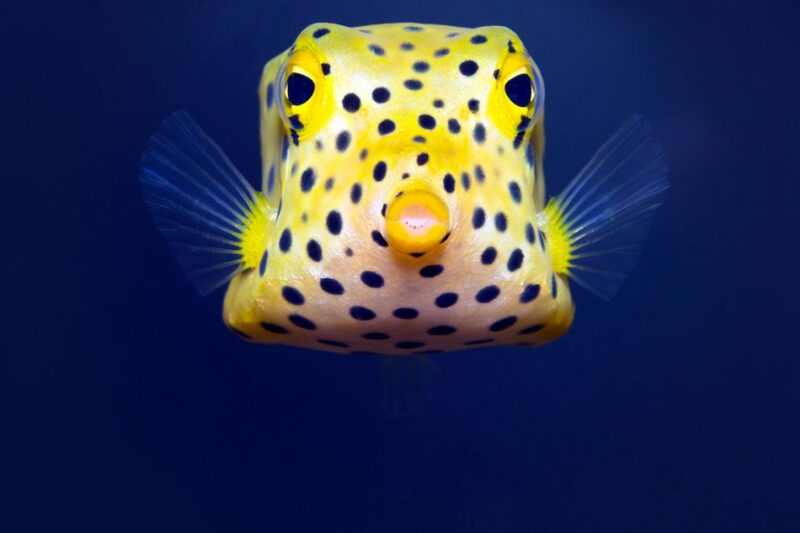 Balloonfishes and pufferfishes, other oddly shaped species, are able to inflate their bodies by swallowing, thus erecting sharp spines to ward off threats. Camouflage and a relatively sedentary lifestyle help comparatively poor swimmers such as sea horses flourish. With a little practice, you’ll be able to make surprisingly accurate “educated guesses” regarding where and how fishes and other marine animals live just by considering animals’ shapes, how they move and what you know about the art of locomotion through the ocean. While the general descriptions of the body designs of fishes provide an overview of the topic of locomotion in the ocean, it probably isn’t much of a surprise to learn that there are many other adaptations that help animals get around underwater. Obviously, animals like lobsters, crabs and shrimps walk on articulated legs, and they can propel themselves backward by rapidly tucking their long tails underneath their abdomen. Sea stars, brittle stars, basket stars, crinoids, sea urchins and sea cucumbers use a water vascular system and their tube feet to grip and walk across the substrate. Squid and octopods use natural “jet engines” to forcefully expel water from their mantle through highly directable organs known as siphons, thus pushing themselves through the water in the opposite direction. Octopods also can make their body into a wing shape and glide through the water. Of course, they can also use their eight arms to walk across the bottom. Many bony fishes of all kinds of shapes possess an internal organ known as a swim bladder that they can fill with gas from their bloodstream to add buoyancy and make them more efficient swimmers, and they can absorb the gas almost instantaneously to subtract buoyancy. Snails, nudibranchs and many other mollusks secrete a trail of lime to reduce their workload as they pull themselves across the sea floor with their muscular foot. Strong flippers help propel turtles, sea lions and seals. Jellyfishes, the Portuguese man-of-war and salps are rather poor swimmers, and they tend to go wherever winds and currents dictate. The upper lobe of the tail of most sharks is larger than the lower lobe and this design tends to push sharks downward as they swim. The hammerlike shape of the head of hammerhead sharks has helped overcome this problem by providing lift like that provided by a wing. Of course, even this list is just beginning to describe many of the amazingly clever adaptations used by marine animals on the move.